« Audio Sniffer: Listen to what your circuits have to say! Hi-fi 16bit DSP on an Arduino? Ever wish you could do serious DSP on your favorite open-source AVR development platform? 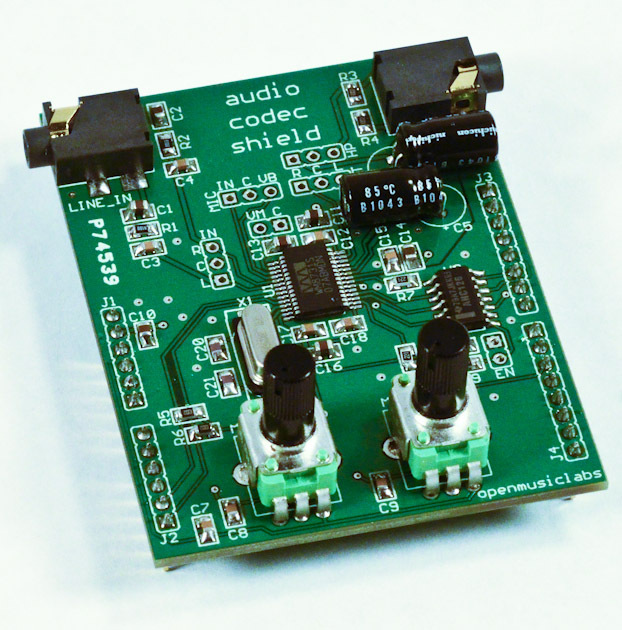 We are very proud to be able to announce the availability of our new Arduino shield for the Wolfson WM8731 audio codec as well as code libraries for both the Arduino and Maple programming environments. To top it all off (triple-feature! ), the new libraries and a bootloader have been adapted for the MICrODEC, marking our first official release in C for the Audio Codec Shield’s big brother. At only $44, we hope that many of you readers out there in internet-land will see the way to accepting some of these little guys into your hearts and homes (and pedal-rigs). For those who want to experiment with digital signal processing for audio effects, compose new kinds of music, make new portable electronic music instruments, etc., this is the best thing that has happened in 50 years. Especially when combined with the Maple board! where could i source one of these in South Africa? There is now a shield adapter for the Raspberry Pi (which currently lacks a Wolfson level codec.) If anyone gets this working on the RPi please, please post notice to the world.